As we begin another week, it looks like it could be a busy one for royal watchers. On Saturday, 8 November, the Duke and Duchess of Cambridge will spend the day in Wales. The day begins with a visit to the Valero Pembroke Refinery, a significant employer and part of the local economy in West Wales for the past fifty years. 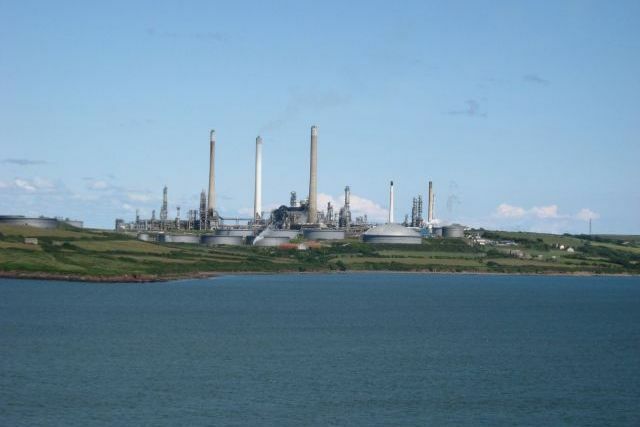 The oil refinery occupies a prominent position on the south bank of the Milford Haven waterway and can be seen for many miles. 'Their Royal Highnesses will view a display which chronicles the 50 year history of the refinery and its relationship with the community, and meet workers, apprentices, placement students and their mentors. The second engagement of the day is one rugby fan William will enjoy in particular. In his role as Vice Patron of Welsh Rugby Union, Prince William, accompanied by his wife will attend the Rugby Union international match between Wales and Australia at the Millennium Stadium in Cardiff. William and Kate will observe the Remembrance tribute at the start of the match and afterwards at a reception William, as patron of the Welsh Rugby Charitable Trust, will meet injured players and their families who are beneficiaries of the trust. There's no mention of Kate attending this reception, although I cannot see any reason why she won't join William there. The match kicks off at 2.30 p.m.
What do we expect Kate will wear for the day? The best guide is to take a look at her attire for the last rugby match she attended at the same stadium in November 2012. William and Kate supported Wales against the New Zealand All Blacks and the Duchess wrapped up in her L.K. Bennett 'Ami' coat and Aquatalia Rhumba boots. As we mentioned in our previous post, we also expect to see Kate on Sunday, 9 November for the National Remembrance Service at the Cenotaph. The service begins at 11 a.m and as always there's excellent televised coverage on BBC One, beginning at 10.25 a.m. It's a particularly important time for remembrance and commemorating the centenary of WWI. UPDATE: Next Wednesday, 12 November, The Duchess will attend a SportsAid athlete workshop at the GSK Human Performance Lab. Kate will meet young athletes who are potential Tokyo 2020 Olympic hopefuls as they part in a number of assessments. Next, we're taking a look at the latest looks from a much-loved British designer Kate has worn several times: Amanda Wakeley. First, a brief look at the Atelier collection. A gown which caught my eye immediately - the Furashiki Heritage Crepe Back Satin Bias Dress in red and peacock green. According to the designer's website the Amanda Wakeley woman is "like the women in Helmut Newton photographs; she is statuesque, Amazonian and striking. 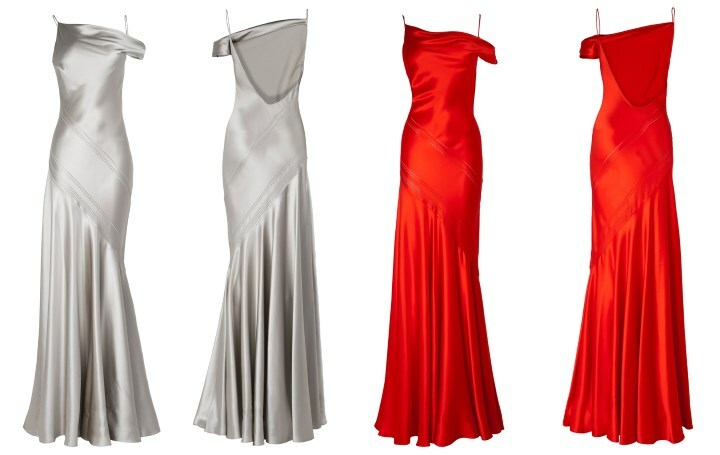 The collection offers long strapless dresses, tailored corset dresses and elegant shift dresses. Take a look at the Kinuli Satin Dress below. The Sayo Wrap-Front Silk Gown and the Grecian-inspired Kasai Dress. Whilst glancing through the ready-to-wear collection I spotted the strapless Senshi Dress with side slit and thought it a tad too daring for the Duchess. And then I remembered this: the jade Jenny Packham gown which was really quite a style departure for Kate and extends the possibilities in terms of her sartorial choices in the future. 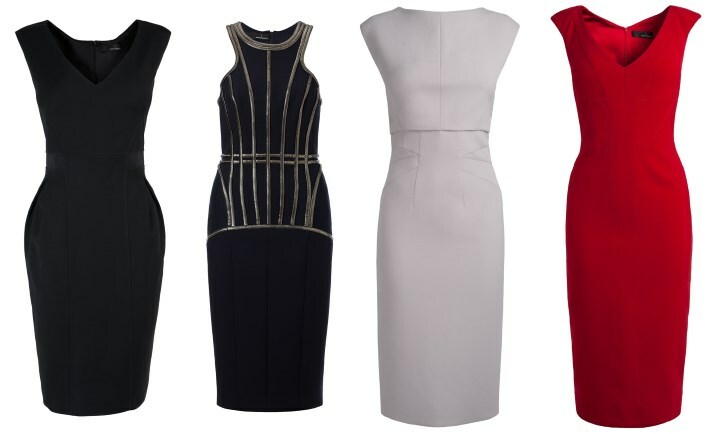 In terms of cocktail and daywear dresses, there isn't a huge selection which instantly scream "Kate", however, notable possibilities include the classic LBD Nadia, the Sorano snake chain embellishment dress, the Nori fitted dress and the Satomi V-Neck fitted dress. 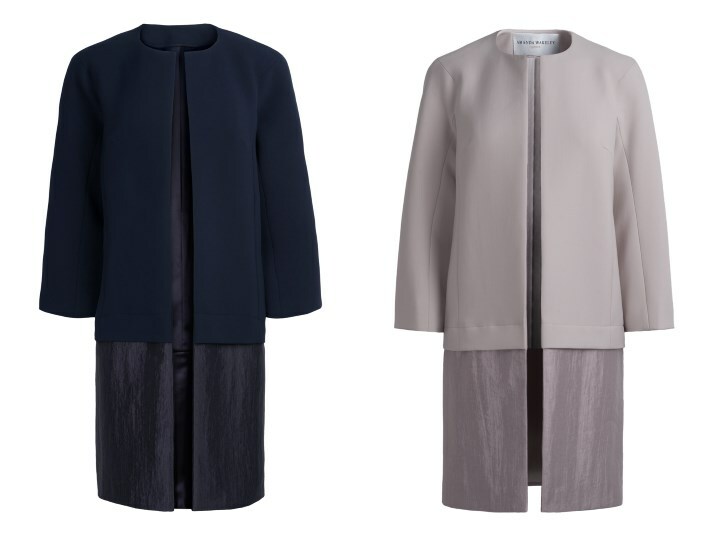 The designer's separates offer cool, sophisticated clothing for autumn/winter with stylish coats such as the Mai Cocoon. What are your thoughts on Ms. Wakeley's designs? Personally I much preferred her collections from a few years ago, however, I do think we'll see Kate in more of her pieces, and recycling the ones she already has. The Duchess graces the cover of this week's Hello! 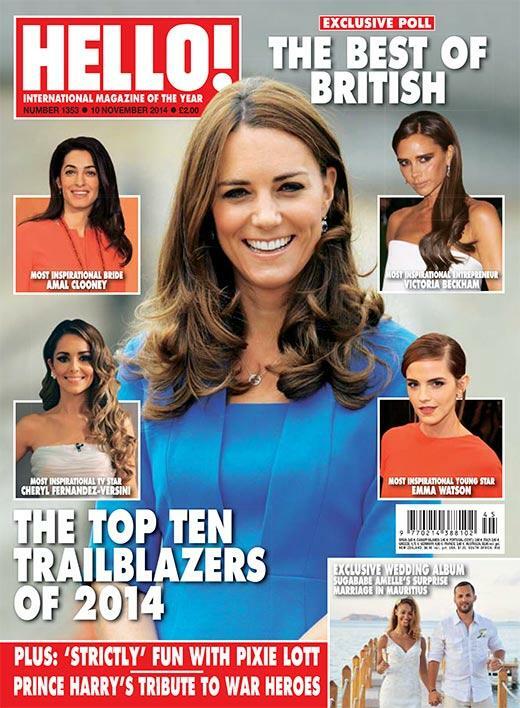 Magazine for their 'Top 10 trail blazers of 2014' alongside Amal Clooney, Victoria Beckham, Cheryl Fernandez-Versini and Emma Watson. Lastly, we want to address issues so many of you have been experiencing when leaving comments. For unregistered users, word verification has been implemented on Blogger blogs. For the moment, it looks as if it's here to stay (in an effort to combat enormous volumes of spam), however with this, comments are not coming through for moderation whilst others are arriving in the spam filter. We hope this will be resolved in the very near future and apologise for any inconvenience you may have experienced thus far. We appreciate the time that goes into leaving comments and love hearing your feedback on appearances and posts. Should the issue persist we'll switch to an alternate commenting platform service. In the meantime, if you have any queries about the issue please don't hesitate to get in touch by leaving a comment or via the contact form on the right-hand menu. But we can see them out and about. I am pretty sure she is going to recycle one of her fave coats and dress too. She must be feeling better. Wonderful !!!! I loved the Kinuli Satin Dress - on the right person (with the right figure!) this one sure is a stunner! I wish everyone a lovely day and, of course, look forward to the 8th!! I don't find anything odd about Saturday's engagements---the refinery is a major employer in an area which had lost a great deal of employment, and William has quite frequently attended Welsh Rugby matches and this one has an element of Remembrance for both Wales and Australia. Did wonder whether they were delegated to attend the Cardiff Remembrance Service on Sunday. I could see Kate wearing one of those coats. I love those satin looking dresses very glam 1930's. She would look pretty in one of those with some jewels! Oh and a tiara. Hehe. No worries about the comments Charlotte. It is just a computer thing. It's happened to me before too, but the world isn't going to fall apart because my comments about the Duchess of Cambridge didn't get posted. You have a nice blog here with good information about her. The first dresses remind me very much of the dress Diana wore to dance with Wayne Sleep. Thank you Charlotte for all your hard work and the interesting information. 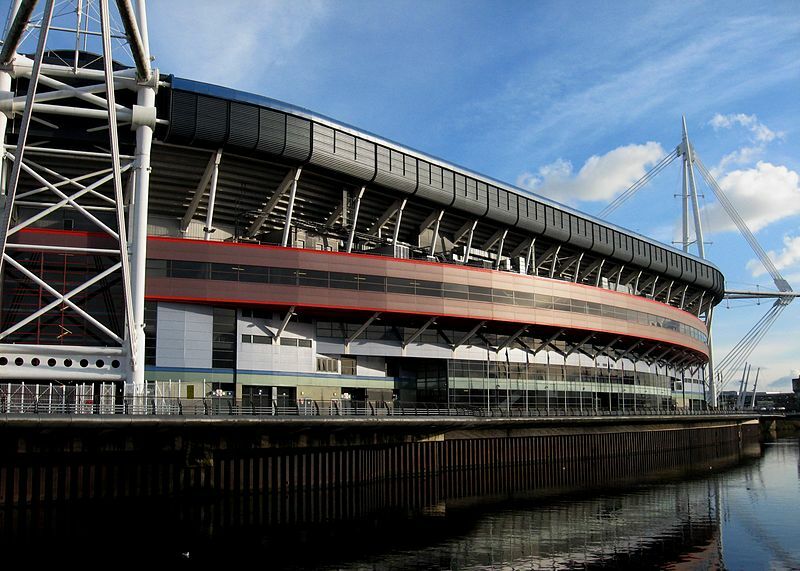 One question, the Millennium Stadium, is that water I see around it? It almost looks like a large ship! Sorry about my ignorance of it, but I was just curious. Bluhare, oh, I am so doing the happy dance! Right after commenting on the last post, I checked out google to set up a blogger account....it was sooooo easy! And as you can see, it worked!! Yeah, doing the happy dance lol! BLERG!! I lost more posts using that account that I've quit. Let me know how you do because for me it got worse when I created the account. I had better luck being plain old bluhare. Oh goodness! I certainly hope that doesn't happen, if I make a long comment, it would be so taxing to try replicating it. Crossing fingers Bluhare, so far, all is well. I was beginning to think something was wrong though Bluhare, because I did notice you weren't using your account anymore. Will definetly revert back if it happens to me too. Thanks for the warning :). Hmmm, I notice I still get the robot thing, but its only numbers now. Is that the same for you Bluhare and Royalfan? Eve, that is what I get now every time also, three numbers. Regardless of still having to do it, with this google account, it is so much easier to make out 3 numbers, as opposed to long words that I could NEVER make out lol. Can you clarify who they will be meeting with at the reception? You state "injured players" - those hurt in the line of duty playing sports... and Rebecca English states "serviceman" - those hurt in the line of duty in war. The Duke of Cambridge, Vice Patron, Welsh Rugby Union, accompanied by The Duchess of Cambridge, will attend the Rugby Union International match between Wales and Australia at the Millennium Stadium, Cardiff. Their Royal Highnesses will observe the Remembrance Tribute at the start of the match, and privately meet injured servicemen in the President's Box during half-time. The Duke, Patron, Welsh Rugby Charitable Trust, will meet injured former players and their families who are beneficiaries of the Charitable Trust at a reception at the conclusion of the match. Thanks for your patience! I realized they were both on the agenda after reading closer. Just read she has an engagement with SportsAid on November 12 as well, meeting young athletes who are in the running for Tokyo 2020! Hi, I always appreciate your posts, they are very well done. I think the Nori dress would work well for her. I love the dress Catherine is wearing in the first photo. Is that Orla Kiely? The photo of Sophie and Kate is also lovely. Thanks for the post. I am trying again to get past robot. I am delighted to see that William & Kate are in Wales for the day especially as this indicates that she is now getting back to full health. That she was well enough to fly to Scotland for a few days with William & George was great as she has seen so little of William over the last 7 weeks while he has been enjoying himself at numerous enjoyable public events and social ones Kate has been housebound suffering from a severe condition William has not behaved as one would expect a truly loving and caring husband would do so different from the very loving husband he was when Kate was ill when expecting George. I see that Kate also has an engagement connected with Sports Aid on the 12th of Nov.
C&C PR team have been working overtime these last few days they have managed to get photos of the trip in the newspapers every day promoting them as a close, caring and down to earth couple at a variety of different events no wonder they wanted W&K out of the papers. I don't think they are too fussed about W&K being in the papers. I think they know the media is superficially obsessed with youth, and with people around the world being able to connect and discuss on more platforms, I think they know more and more people are realizing they are hard-working, close, caring and down-to-earth people. I think they are more confident in their older age than they were when they were younger, and they know they are prepared for their role. I guess I have missed Williams engagements because I have not seen anything regarding him being busy with royal business. And how do you know that they have not seen each other much in 7 weeks. You make it sound like William has been out partying while Kate has been home sick. What about her Nov. 12 appearance? The post was published before this engagement was announced. It's been added now. I thought the navy blue evening dress in the a relief collection would be a good choice when needing maternity clothes. It would cover a bump very nicely. Thank you again for a wonderful and informative article. I'm so glad to see HRH will be out this weekend and next week. I'm glad that she seems to be feeling so much better. I'm not a big fan of the fashion this time around, except for the blue strapless with the slit. I'm so glad to see another engagement coming up and that must mean the Duchess is feeling better which is the best news! I can't wait to see what she's wearing (of course) and how her bump is progressing. How exciting! As for the gowns, they are hideous. Satin is one of the most unflattering materials ever and I can't imagine Catherine wearing it (and hoping not). The day dresses are pretty plain and unflattering. All look very much too old for Catherine. There are many more flattering designs she could choose. Thank you for your comments. Please let me know if any of you are not getting comments through or experiencing issues. Knock wood, but I think now I'm back to no account status, they're all going through. I think only one of my comments did not make it here after the anti-robot function appeared. Initially there were some illegible numbers and letters, but they seem readable now. I'm glad to know there will be William and Catherine events in the coming days. William as well as Kate has been largely missing, probably helping take care of her and George and training for his air ambulance job. I don't really like any of the dresses, but I really didn't care for the last three Kate wore, so who knows. The coats might be very nice for maternity wear if they did not have the weird change of fabric at the bottom. If they were made all of a soft blend of wool and cashmere in a pretty color, I could like them a lot. Thank you for this post, Charlotte. You always do such a good job with these. I agree with another comment that said this collection of AW gowns evokes the feeling of 1930s gowns--it's the satin I think. I can definitely see Jean Harlow in these dresses, but the Duchess? Not so much. But still, I am ready to be pleasantly surprised at her wearing something I didn't like and rocking it so that I have to change my mind. I have had trouble in the past with my comments not getting through here, but it has been months since that happened. I happen to have my own Blogger blog, and bluhare mentioned that having an account seemed to make things worse, not better, but my experience has been hit-and-miss. Lately I have had no trouble. And I never have had to verify that I'm a real person--I guess that is one advantage of having a Blogger account. *Later* just as I tried to publish this comment, I got my first verification prompt! How ironic. It has been fun for me to come see your posts every couple of days and read over the comments and sometimes add something. Thank you for creating and maintaining this blog; it must be a huge amount of work, and you do it so well. I didn't care too much for the AW dresses. It will be interesting to see what maternity wear Kate will don and what she'll try to recycle. Something to look forward to! Hello everyone, I've been following here for a while now and thought I'd just try to post to see if it works. I love reading about Kate, and realise that it was the same with Princess Diana. There is something about both women that I admire - perhaps it's taking on a role very different from what they expected/were used to, and making it work for them. I like the pleats extended into seams on the strapless gown. That effect could be lovely on Kate, but I rather hope she has had her fill of nonsense slits with bare legs. The first photo in the post, which is very nice, shows bruising on Kate's leg, the same leg that once had a scratch or repair. I wonder what she does that injures her left leg. My repeated bruise comes from bumping into the corner of my dog's crate. Ouch. And I've injured more than one toe by running into furniture when I was barefoot. So you have a point. I just wondered if maybe construction jobs or sports might be the bugaboo for Kate. The scar from the scratch or incision last summer is still just visible in the picture above, blue gown with bare leg. Jenn I have had some nasty things said to me in the past so I took it as a slap in the face. But you are saying it was a joke, then ok.
A pattern with the Cambridge's is they make sporadic appearances most of the year then blitz through a bunch at the end of the year to get their numbers up. It also prevents bad PR when they go on their annual holiday to the tropics in January. I'm very excited to see them, but not surprised that there is an influx of engagements on the calendar this time of year. Thank you Stephanie. I think so too. Interesting that William and Catherine will be at the Royal Variety show on the 13th.Over the last few years has alternated between the Queen and the Duke and Charles and Camilla. Would have been HM's turn this year. It is usually black tie---so a gown for Catherine. Sadly one of the occasions that used to merit a tiara, but no longer. Thanks for posting Jean! A gown for Catherine.....woohoo! Definitely looking forward to this engagement! Great post about these upcoming engagements. One more was announced today as the couple will attend the Royal Variety performance for the first time on November 13- which means an evening gown for Catherine. Looking forward to seeing them out this week and I hope for sone good fashion to comment about. Bluhare, almost forgot, I did what you did. I actually bought that magazine with the "crazy" story about the Queen "making" Catherine get back to work, regarless of her sickness. Lol, you were so right! It was actually funny, reading it as fiction. It said that the Queen "made" her do the most recent engagements, whether she was sick and throwing up, or not. I do believe that the Queen would like to see her doing more, perhaps, but I don't believe that she would insist on it, regardless of Catherines' health, or especially, the health of the baby/heir, she is carrying. And one thing I did notice, and I'd like your opinion, and anyone else as well. There was a picture of Catherine, from when her and William were meeting the delegation from Singapore, where Catherine really did look to me like she was possibly feeling like she might get sick. I have seen it from many magazines and websites, not just this fictional magazine. Did you Bluhare, notice this picture, or anyone else? And what do you think? I guess it is entirely possible she was still feeling ill, since she had been so sick. I feel, like I'm flailing here, trying to make myself clear, sigh. I guess what I'm asking is this: I believe the bunk about the Queen is not true the way it is being said in this particular magazine...however, does anyone think it possible, at all, that Catherine had pressure from the Queen, or anyone, to make an apperance, before she felt well enough to? Whew, ok, I finally got it out lol. Sometimes I feel like what I'm saying on here doesn't make sense lol. Need a rest after this mental stress, lol, be back later. Tc all. There were times she didn't look happy. I think its possible she had pressure to make an appearance but not before she felt well enough to. Yes Rebecca, that's it, the morning of the state visit. No, I didn't think the carriage ride was the best idea either. I don't believe for one minute that the queen would force Catherine to go back to work when she has been so sick. And I feel William would not have it either. And I think in the same thrash magazine or it might have been another one saying that they are fighting and living separate. And possible getting a divorce so the queen made them do the baby moon. Well if this was all true then why is she pregnant with their 2nd baby. And to look at them during thier engagement they still had the glow to them and William was looking at her with concern in his eyes. I gvuess since it has been a very slow Catherine sights that thye have to make up crap. Jenn, the Queen is a very hard worker and does put duty above all else, but I also think she is kind and compassionate. I don't think she would pressure Kate into working. The last thing any of them want is for Kate to greet a foreign dignitary and start vomiting. That being said, I do think that as soon as Kate was feeling better, work was expected. This is just my opinion. Rebecca, the carriage ride pictures,,,,oh dear. Kate looked so unwell. Poor thing. Glad to know she is feeling better and that the few days will be busy for W&K! I cannot believe that HM pressured Catherine to carry out engagements whilst she was ill, it would have been somewhat hypocritical, as with her first two children, she gave up engagements as soon as she knew she was pregnant---that was the way it was announced---£Her Royal Highness the Princess Elizabeth will undertake no public engagements--or words to that effect. I remember asking my mother why and being told that was the way the Royal family announced a pregnancy. Don't remember about the younger ones, as by that time I was no longer a schoolgirl and had other things on my mind. I think the carriage ride was most unfortunate ---Catherine looked really quite ill. The Queen has been very dutiful, but has been fortunate with her health, however in the early years of her marriage she spent long periods in Malta---even leaving her children at Sandringham over Christmas. That's really interesting that the queen didn't do engagements while she was pregnant I didnt know that, I still find it very odd she left charles and anne with the queen mother while she returned to Malta for lengthy periods with Phillip. Some if the royal families actions are odd. Pay no attention to Globe magazine. It also says the Queen is 'sick and fading fast.' Is that the way she looked today at a WWI ceremony, with her husband, grandson, and the King of the Belgians? Ha. These rags seem to thrive on their idiotic lies, but I can't imagine why. The article was written very sympathetic to Kate. Very. It was pretty funny actually. The Queen ordering Kate to work while Kate's vomiting all day and hooked up to IV's. Riiiight. Anonymous, keep in mind it was 1949-1951 and she was the Princess Elizabeth the first time. Heir apparent and a woman. It would not have been done to be out in public with a belly. Remember this is the woman who thinks the word "toilet" is vulgar. I did not know that about the Queen either, of her not doing engagements while pregnant, but it does make sense, given the year and era it happened in. Bluhare, yes, that was actually funny....the whole vomiting/IV thing. Some of the comments being made in some of the trashy American magazines are laughable. I do not believe for one moment that Queen Elizabeth would in any way force Kate to go back to work whilst she was so sick. Remember it is not only Kate but the wellbeing of the baby that is at stake. I am sure that the Doctors made the decision of when she was well enough to undertake an engagement and even then it was made clear that she was not fully recovered, unlike when she undertook her first full engagement after being ill when expecting George. As to the other nonsense about W&K fighting and living apart this seems to be based on the fact that she spent a week with George at Buckleberry it was only a week as the Daily Mail made clear in their article at that time that she was back at KP. William is busy training but no one knows where he has to go for that training probably for security reasons. Helicopter training both for his civilian Licence and for the new Aircraft he will be flying will be done by his new employer Bond Air Services so it may well be that he has to go to where they do that training which may have required him to live away from home for a short while because I doubt if he would have wanted not to see George for a week if he had been at KP. I just hope these magazines stop publishing these ridiculous stories of the Royal Family generally. Looking forward to the Welsh engagements although I don't think they will get much publicity but I think their attendance at the Royal Variety show will get a lot more press coverage. I hope this post works. I have found it very difficult to post. Most of the time, my comments never show up. Anyways, I was looking through photos of the Royal Variety Performance and it seems that is a very formal event. One that would require a full length gown, possibly beaded, and I was wondering if it might be possible that Kate would wear a tiara to this event? Charlotte, what are your thoughts. I am so sorry to hear about your commenting issues. I sincerely hope it is resolved soon. I definitely think Kate will wear a full length gown, no tiara I'm afraid. I actually don't like any of the satin or bias cut dresses. The pictures may not do them justice, but they don't seem to reflect the quality you expect from EW. The other dresses, however, I would love to see the Duchess wear. Oh I do hope Kate is really feeling better. Each of my pregnancies got worse with the hormones raging. Ugh. but , yes at some point you just have to get up and move.